Home /Materials selection for CNC machining price. Material selection can impact the CNC machining price. Material selection is critical in determining the overall functionality and cost of the CNC machined part. There is a big range of materials machined to be used for parts. Choosing the right materials and material grade will determine the life time usage and the wear factor. Examples of most used materials selections. Each of these materials could have hardness grades and different composition. Material selection is critical in determining the overall functionality and the cost of the part. You must choose important material characteristicsâ€”hardness, rigidity, chemical resistance, heat treat-ability, and thermal stability. Just to name a few you will need to nominate this in your quotation request. Why does the materials selections effect the price? These materialsÂ must be machined with slower CNC machine spindle R.P.Ms and CNC machine feed rates. What is an example of the differences for material selections? Explain more about the different grades. Material grades also has an effects the cost CNC machined parts. 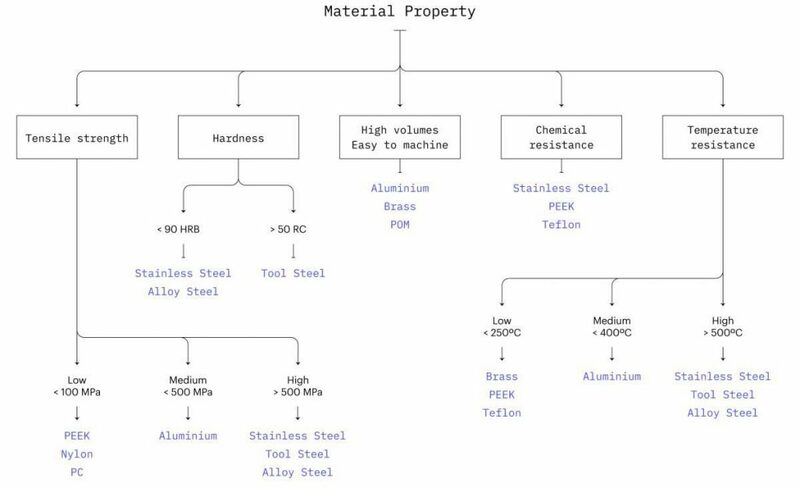 For a cost comparison example, 6061 aluminum bar stock is approximately half the price per kg than the cost ofÂ aluminum plate.